An assembled Benni�is�about 22" long. Benni comes unpainted. Finished results will vary. Body slips do not include stuffing. 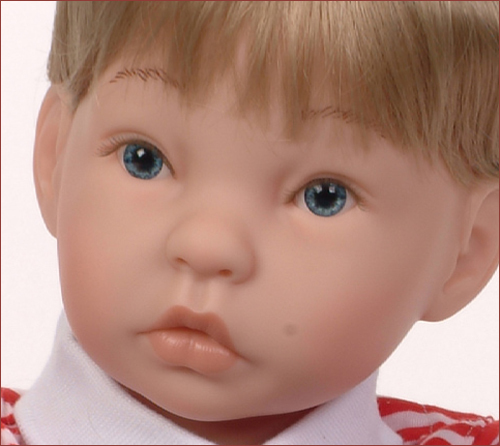 Benni comes in Secrist's own special baby-soft vinyl that is translucent just like a real baby's skin. Secrist's vinyl was designed specifically for reborners and is preferred by reborners world wide. Benni uses 22" limb sets and body slips Eyes come pre-inseted when ordered with the doll. Benni takes 20mm eyes. Make it a complete kit by checking the options below! Secrist offers two types of limbs for most dolls, 3/4 and 1/4. Be sure to get the body slip you need for the limb set you order! Reborners who prefer to display their doll prefer 3/4 limbs to allow for a greater variety of garments the doll can be dressed and displayed with. Reborners who favor a soft feeling reborn baby in their arms, or those on a budget, choose the 1/4 limbs. Most Secrist body slips come with cable ties already inserted, with the exception of the 12" Micropreemie Cotton Body Slip which comes with strings. These body slips have an ideal shape for a baby. The kind of body slip you use will strongly impact the feel of your baby nestled in your arms. Want huggably soft? Choose a Doe Suede slip for it's super soft texture or simply to add an extra touch of premium to your reborn baby. You put a lot of effort into reborning your babies and you know you and your reborn are worth it! Upgrade to Doe Suede.